Devin Booker of the Phoenix Suns set a new record in the three-point contest. (Courtesy of Maddie Meyer). Beginning on Friday, Feb. 16 this year’s National Basketball Association (NBA) All-Star weekend was filled with unforgettable moments. The Rising Stars game, a collection of high-profile rookies, was packed with high-flying dunks and standout performances from Sacramento guard Buddy Hield and Boston’s own guard Jaylen Brown. Brown racked up 35 points off the starting lineup of the USA Team, and Hield scored 29 as a starter for Team World. Other notable performances included 26 points for guard Bogdan Bogdanovic of Sacramento on Team World, and 20 points for the Los Angeles Laker’s forward Kyle Kuzma on the USA Team. The game was complete with flashy dunks and a competitive spirit. On Saturday, Feb. 17, the weekend kicked off with the slam dunk contest, three-point shootout, and skills challenge. In the three-point contest, guard Devin Booker of the Phoenix Suns caught fire and set a new record for the most points scored with 28. 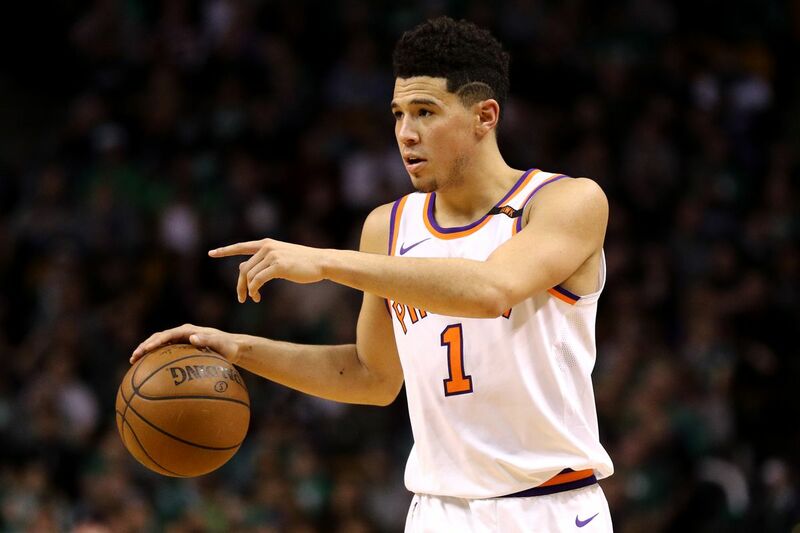 Originally from the University of Kentucky, Booker is in his third year with the Suns and continues to set records every season in the NBA. This year’s slam dunk contest was packed with exciting and interesting dunks from a variety of players. In the final round, Utah Jazz rookie guard Donovan Mitchell defeated forward Larry Nance Jr. of the Cleveland Cavaliers. Mitchell performed his final dunk wearing an old school Toronto Raptors jersey, paying homage to dunk contest legend Vince Carter and pulling off his trademark reverse 360-degree dunk. The runner-up, Nance Jr., had some memorable dunks as well, paying his respects to his father Larry who won the first ever dunk contest in 1984. Last year’s winner, guard Glen Robinson III, was not able to defend his title this year due to his current recovery from ankle surgery. The main event on Sunday, the all-star game, defied expectations and proved to be both competitive and exciting. This year the teams were established in a different manner; in previous years, the teams were formed simply by taking the best players from the west against the best players in the east. This year, Golden State Warrior’s guard Stephen Curry and Cleveland’s forward LeBron James were nominated as team captains to draft from the pool of selected all-stars. This created a much different atmosphere, and players were motivated to represent their teams and play hard. In past years, the all-star game was not a game where players exerted any effort on defense, and the ridiculous high scores were due to players taking absurd shots and dunking on every other possession. The changes in the all-star game format were much needed, and they provided players and fans with an exciting game between the top players in the league. With the all-star weekend all wrapped up, NBA teams now look to the second half of the regular season and then the playoffs.